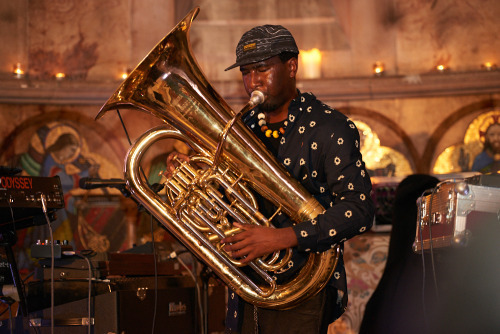 Hosted by NTS Radio’s Tej Adeleye, the live intimate gig was headlined by Kamaal Williams and supported by the South-London based producer and bass player Wu-Lu and experimental tuba player Theon Cross. The up and coming artists performed on the altar of the atmospheric, stained glass clad 19th century chapel in the courtyard of The House of St Barnabas to a crowd of jazz enthusiasts as well as fashion influencers and media guests. Fashion and music are intrinsically entwined and Farah will continue to document the underground explosion of contemporary jazz happening across the UK in a follow up documentary to last year’s short film ‘NICE UP THE DANCE’ which celebrated the history of UK Sound System Culture.